Thanks for the comments on my new background. I am constantly experimenting. I really love it - my header - not so much. But I'm holding out for a few more months and then I may jump on a complete blog makeover! I already have something picked out................................stay tuned! If you want to do what I did - I stumbled upon a blog in the fall who explained it in detail. It took me a long time to figure it out but if you want to try - here you go. Just make sure in the code that you type repeat-repeat or it won't tile properly. Here are the instructions. (I fixed the link!) One site that has a lot of great background patterns (in the form of fabric samples) is http://www.warmbiscuit.com/. Next - this weekend my mom forwarded me a blog that is about to go on my favorites. Even though I woke up this morning and declared "I will NOT eat sweets today". I am weak. This site has all kinds of great ideas - including lots of forms of cake balls. The picture above are balls she made with ground up (get ready for this) NUTTER BUTTERS! I am totally making these. My mom and I had about a 20 minute conversation last night on all the forms of cake balls we plan to make and all the different events we plan to make them for. This site also made cute little footballs out of cake balls. And last - my friend Hillary already posted about this this weekend - but just in case you didn't read her blog (and you should)- I am on a roll of cooking and posting recipes so here you go. I plan to make these tonight. 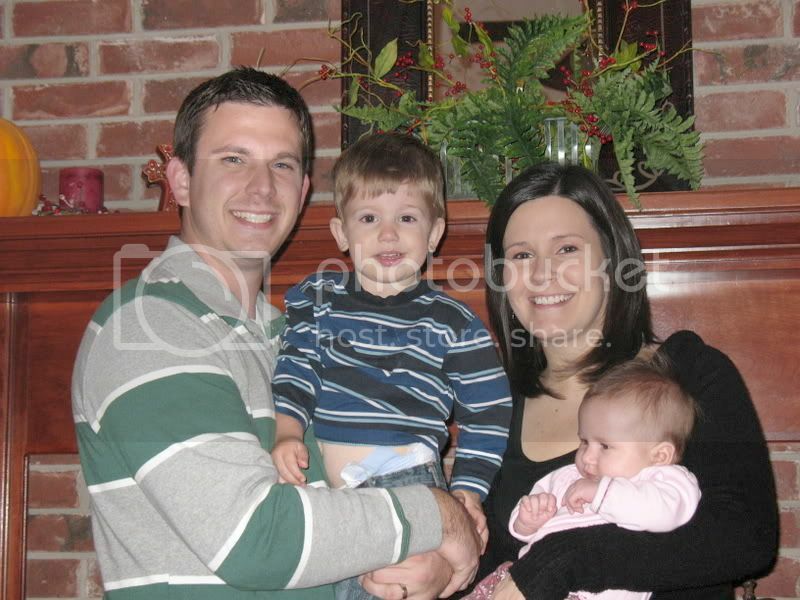 I got these off of Annalee's blog and later Sunni's blog. So if they all three liked it - it's good enough for me. DIRECTIONS:PREHEAT OVEN TO 400 DEGREES.BROWN THE BEEF AND DRAIN.MIX KETCHUP, MUSTARD, AND BROWN SUGAR TOGETHER TO MAKE A BARBECUE SAUCE.ADD THE SAUCE TO THE BEEF.SEPARATE DOUGH INTO BISCUITS.FORM DOUGH INTO CUPS ON THE MUFFIN TINS.SPOON THE MEAT INTO THE DOUGH CUPS.BAKE AT 400 DEGREES FOR ABOUT 10 MINUTES(OR UNTIL THE BISCUIT DOUGH LOOKS DONE).SPRINKLE THE TOPS WITH CHEESE.AND DINNER IS SERVED! I LOVE the nutter butter ones! And I'm totally adding that link to my fun blogs! I wish I had a million cake balls right now! OO all that looks soo good! I do like that background! i love that warm biscuit site! thanks for sharing it. That ALL looks delicious! And I like the new background. I don't know if anyone has mentioned this or not since I didn't read all your comments under the Cake Ball recipe post, but I've made Oreo balls in the same way. 1 package of Oreos, 1 package cream cheese. Crush the cookies until fine. Mix with cream cheese until blended well. Form into balls and dip in melted almond bark. They are so yummy! Will definitely try cake balls sometime soon! Love the new page layout Kelly! This is where I get a lot of my backgrounds and I love it! Kelly- The nutter butter balls sound sooo good. At this pace I will never fit into my pre-pregnancy clothes:) Oh well. Let's eat! Yum! I am getting hungry! Your new background looks great. I am going to try and change mine. LOVE THE NEW LOOK!!!! very very cute!!! I already copied down the meat cupcakes recipe from hillary's blog and plan to make it this weekend. i like your new blog look-i still can't figure out how to change mine. i need a lesson! Oh my goodness, Kelly! Thank you so much for the link to warm bicuit! 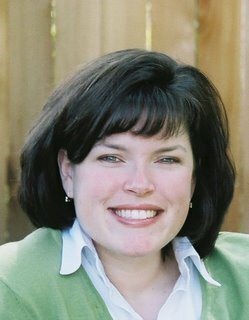 I just started a blog, so I am so excited about trying new things!! :) And those nutter butter chocolate balls look like they are to die for! You always have such great ideas! Oh I cant wait to make the meat cupcakes, yummy!!! I am gonna go to that site to spice up my blog! Hmmmmmm, I tried to click where you say here to go and jazz up my blog but it doesnt do anything?? Can you give me the link?? Ha! I just wrote about needing to buy new clothes that fit me better - after having a baby (yes, it was over a year ago - but shhh)! But after the reaction of happiness I felt after seeing that picture of the cake BOMBS - I'm thinking that sweets and desserts may be my true culprit!! Yummy! YUMMY!! I'm hungry now. Thanks! ha!! I can't wait to try the meat cupcakes. Love the new look. I couldn't get the instruction link to work though. Oh my word... I checked out that blog and allll of that stuff looks deLICIOUS... And yes, the options on "cake balls" are endless!!! I am copying some of those down! Hey girl! I love the new look of your blog! The color and pattern is great and I love the picture in the header! Cute! Thanks for sharing all the recipes too. I love trying new things. Yum, yum and more yum and the blog looks great! Isn't it fun to experiment with the blog? Love the blog look! Don't all those treats look so delicious...I am craving a Nutter Butter now! I have been wanting to make those meat cups because Sunni has gone on & on about them, but our silly oven is not working right now. I also want to make those chicken dishes you posted. Sunni keeps telling me how good they are too! THANKS for the background info!!!! I can't wait to start playing with different ones. 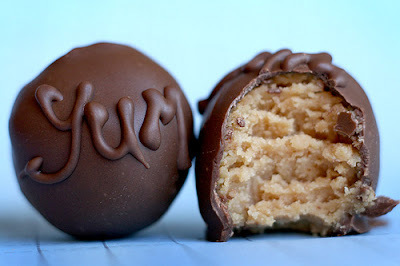 I'm so making the Nutter Butter cake balls!! They look so good! Those meat cupcakes look good too! Thank you for posting that blog link...I love to bake! Hello...I have wondered to your blog from Jessica's blog. Your blog is great...and looks great too! I can't wait to try me some cake balls...the nutter butter ones FOR SURE! 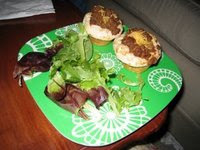 I do this "meat cupcakes" but when I found my recipe, they called them "beefy biscuit cups". Pretty similar except I use spaghetti sauce and then mozzarella cheese on top! It is SOOO good! I may have to try your recipe too just to change it up some! Oh...and I totally watched a ton of those "Love comes softly" movies last weekend. SOOOOO good! Hi Kelly! I haven't had a chance to comment in a while, but wanted to send a note to say HI! Hope you're doing well and staying strong. Keep the recipes coming!!! You are inspiring me to cook, and I am not a good cook! I think I will have to try those meat cupcakes sometime soon! 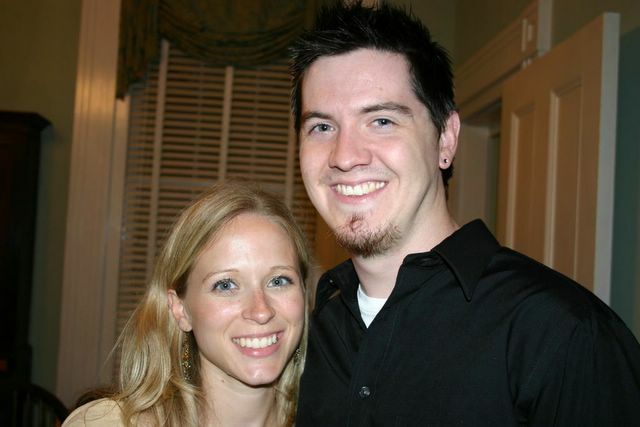 I'm a friend of Rebekah and Megan's and just wanted to drop in and say how much I like your blog. You seem so transparent, and I love the food. The Chicken Supreme was excellent. oooh i love nutter butters. i will have to try that one!! Those BBQ cups are fab, aren't they?! Warm Biscuit is great! Love their stuff. Your layout is really pretty. I love the damask. I did finally figure it out but I think I am going to change to another print. uggghhhhh which means i have to start over. Thanks for linking me, I placed you in my links too! I totally accidentally deleted your post, sorry! I get so confused by LOST too, but that's why I love it, check my blog every Friday for my "WTC???" blogs all about my confusion, haha! However, I also love it because it has this really cool spiritual aspect to it. See you soon! I want those little chocolate, nutter butter pieces of heaven in my house right now. I think I am in love with them. Love the new background! Thanks for adding the link for the rest of us to learn how to become techy ourselves. You inspired me to change mine, too. Thanks! Love your blog! I tried and tried and COULD NOT figure out how to change my background!!! I'll have to get Brian to do it for me!! Love the background!! Also the header! Headers are so hard to change!! I love your new background & am so impressed that you plugged it in. I'm always having to ask Hubs for technical support. Can't wait to see your new blog theme in the spring! did you get the new southern living yet..the one with the daffodils on it? Kelly, The blog with the food on it is CRAZY! I made a BUNCH of the oreo balls around Christmas time and I got sick of them. The good thing is everyone loves them and they think you are AMAZING! I would try the cake one you showed but I'm trying to eat healthy (meaning ate one too many oreo balls and went on Weight Watchers :)).